Q1. What is an Australian native bee? Q2. How many types of native bees are there in Australia? Q3. What are solitary bees? Q4. What are social bees? Q5. Do native bees sting? Q6. Do native bees make honey? Q7. Can native bees be used for crop pollination? Q8. Where are the Stingless Native Bees found in Australia? Q9. 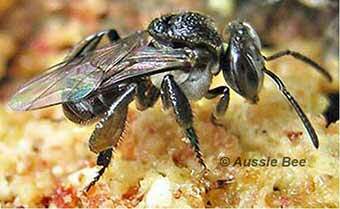 How can I obtain a nest of Stingless Native Bees? Q10. How can I attract native bees to my garden? Q11. How do native bees get along with commercial bees? Q12. What sort of native bee is nesting in my house? Q13. Do we have any Bumble Bees in Australia? Q14. What are the differences between bees, wasps and flies? Q15. How can I help save Australian native bees? The best known bee in Australia is the yellow-brown commercial Honey Bee (Apis mellifera). This is not a native bee, even though it sometimes goes wild and builds nests in our bushland. This bee was introduced to Australia from Europe in about 1822 to produce honey for our pioneers. Hundreds of other bee species, of all shapes and sizes, visit our gardens and wildflowers. These are our own Australian native bees which have evolved with our wildflowers for millions of years. A native Blue Banded Bee roosting on a stem at night. 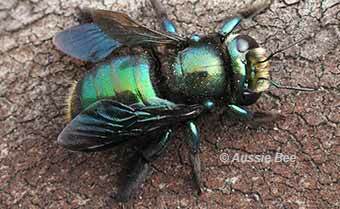 ...while this native Carpenter Bee is glossy metallic green. The vast majority of Australia's native bees are solitary but Australia also has eleven species of social Stingless Native Bees (see Q4 below). More information about our many different kinds of native bees can be found in our native bee field guide. Nearly all of Australia’s 1,700 native bee species are solitary. Solitary bees do not have queens and workers. Instead in most species, just one female bee mates with a male and then builds an individual nest for her eggs, just like a bird does. A solitary Resin Bee has built her nest inside this small bamboo cane. One side of the bamboo has been carefully cut away so we can see the row of six tiny cells for the young bees inside the nest. 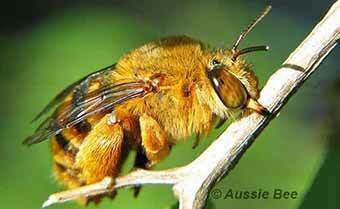 Blue Banded Bees, Resin Bees, Leafcutter Bees and Teddy Bear Bees are examples of solitary bees. Solitary bees do not store any honey in their tiny nests. Australia has eleven species of social native bees (genera Tetragonula - previously called Trigona* -- and Austroplebeia). These bees are mostly black and they are only 3 to 4 mm long. They have a queen plus hundreds of sterile female workers and some males in each nest. Our social native bees are the Stingless Bees and they usually nest inside hollow trees. Two common species are Tetragonula carbonaria and Tetragonula hockingsi (previously called Trigona carbonaria and Trigona hockingsi*). * Why have their names been changed? This social native bee nest, inside a large hollow log, is home to 5,000 to 10,000 Tetragonula carbonaria Stingless Bees. Although our Stingless Bees are more primitive than commercial Honey bBees, they have a fascinating and complex social behaviour. 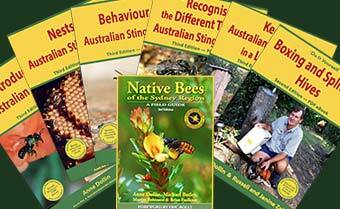 For more details see the ANBRC booklet, Behaviour of Australian Stingless Bees. A Tetragonula carbonaria native social Stingless Bee worker. Australia has over 1,700 species of native bees. Only eleven of these species are stingless! These are the social native Stingless Bees, Tetragonula and Austroplebeia (see Q4 above). All the other native bee species in Australia can sting. Most are too small to deliver an effective sting and Australian native bees are not aggressive. However, if one of the larger native bees is picked up or trodden on, it could be quite capable of stinging. Most stings are not as painful as those of a bull ant or paper wasp and last only a few minutes. However, a native bee can sting more than once and it is possible to be allergic to the sting of a native bee. So please treat native bees with respect. Australia's 1,700 species of solitary bees do not store any honey in their little nests but only collect tiny amounts of nectar to feed their young. However, the eleven species of social Stingless Native Bees in Australia do make and store small amounts of a delicious aromatic honey called Sugarbag. This honey has a delicious, more tangy flavour than commercial bee honey and is stored by the bees in small pots which look like bunches of grapes. 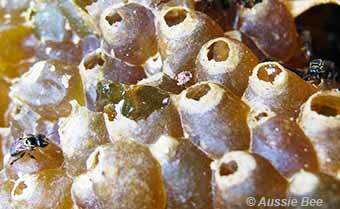 Austroplebeia Stingless Bees store their delicious Sugarbag honey in these delicate pots. 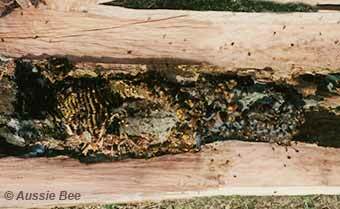 We do not usually recommend that people try to get honey out of native Stingless Bee nests. These bees are primitive species and do not make much honey. In cooler areas they need all their honey to get through the winter months. Furthermore, if even a small amount of honey is spilt in the nest, the bees can drown in it. However, if special techniques are used in warm areas of Australia, honey production with the social native bees is possible. Read more about honey production with native bees. Most crops in Australia are pollinated by the commercial Honey Bee, Apis mellifera. However, because of their size and special behaviour, native bees may be better pollinators of some crops. For example, Stingless Bees are efficient pollinators of macadamias and Blue Banded Bees show potential as pollinators of greenhouse tomatoes. Read more about crop pollination with native bees. The social native Stingless Bees that produce honey are tropical bees. They are only found in warm areas such as the northern half of Western Australia, the Northern Territory, Queensland, and northern and coastal areas of NSW. In marginal areas such as south coast of NSW they survive much better in a natural log than in a box because the log provides much better insulation. They are unlikely to survive without special artificial support if taken to areas outside of their natural range. Find out what types of native bees are in your area. Nests of the social native Stingless Bees can sometimes be obtained by asking timbercutters or firewood agents to rescue a nest for you from the logs they are cutting up for sale. Alternatively you may be fortunate enough to find a nest yourself on private land. Remember it is illegal to remove native bee nests from National Parks and reserves. Some Stingless Bee keepers rescue nests from sites such as newly cleared land subdivisions and propagate these nests in boxes. Boxed nests may be purchased from these beekeepers. Click here for lists of hive sellers. Land clearing and landscaping can destroy food sources and nest sites, threatening native bees. You could help by planting nectar-rich flowers and providing new nest sites in your garden. Good plants for attracting native bees include: Abelia x grandiflora, Angophora, Baeckea, Buddleja davidii, Callistemon, Eucalyptus, Grevillea hybrids, Hardenbergia violacea, Lavandula, Leptospermum, Melaleuca and Westringia. Read more about planting a Bee-Friendly Garden, and about flowers that are loved by native bees. 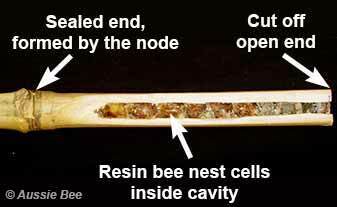 Bee Hotels can provide valuable nest sites for your local Resin Bees, Leafcutters and Blue Banded Bees. They can be made from bamboo canes, blocks of wood drilled with holes or clay soil. Read Aussie Bee's Guide to making a Bee Hotel. If commercial Honey Bees (Apis mellifera) and native bees are foraging on the same flowers, they do not fight one another. However, commercial Honey Bees are much better foragers than most native bee species and they can often fly at much lower temperatures. If there is plenty of food available, this would probably not cause a problem. However, in a situation of limited food resources, the native bees would probably come out second best. Most of our native bees are tiny, fragile, almost inconspicuous creatures and such bees would have great difficulty competing with the highly efficient commercial bees we have introduced from Europe. Q12. What sort of native bees are nesting in my house? The bee that people most often find nesting in their house is the introduced commercial Honeybee. Swarms of these feral Honeybees may try to nest in wall cavities or inside chimneys in houses. However, sometimes native bees will also nest in houses. Read our detailed guide with information and photos about bees that nest in houses. 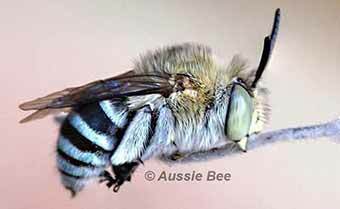 The native Blue Banded Bee sometimes digs its little nest burrows in soft mudbricks or mortar in houses. This bee is about 11 mm long and has a black hind segment with opal blue or whitish stripes. In northern areas of Australia two species of social native Stingless Bees (Tetragonula sapiens and Tetragonula clypearis - previously called Trigona sapiens and Trigona clypearis) may nest in wall or door cavities. These bees are tiny (3 to 4 mm long) and black. Although they may smear some resin around the entrance of their nests, they are cute and harmless and normally do no structural damage to the houses. There are no native species of Bumble Bees in Australia although two of our native bee species, the giant yellow and black Carpenter Bee (Xylocopa) of Queensland and northern NSW and the golden-brown furry Teddy Bear Bee (Amegilla), are often mistaken for Bumble Bees. Bumble Bees are furry, yellow and black bees originally from Europe which build social nest colonies in little holes in the ground during the summer months. In 1992 one species of Bumble Bee (Bombus terrestris) was introduced accidentally to Tasmania. Studies in 2001 by Andrew Hingston of the University of Tasmania indicate that this Bumble Bee is now found from coastal to alpine areas and across the full spectrum of annual rainfall in the state. This bee is breeding in at least six National Parks, including those in the World Heritage area. It appears to have a negative impact on some local Tasmanian native bee species. Bumble Bees are not presently found on the Australian mainland and Andrew urged that all reasonable efforts be made to prevent their spread to the Australian mainland. In 2006 the Australian Hydroponic and Greenhouse Association applied to import European Bumble Bees to the Australian mainland for greenhouse tomato pollination. Their application was rejected by the Federal Government because of the harm these exotic bees could do to our Australian environment. For more information, see: What Harm Could Exotic Bumblebees Do in Australia? Both bees and wasps often sip nectar from flowers. However, bees feed their young with pollen collected from flowers while wasps feed their young on insect or spider prey. So if you see an insect collecting pollen from a flower, it is a bee, not a wasp. You might say: wasps are carnivorous while bees are vegetarian! All bees and wasps have four wings, but flies have only two wings. Flies also have shorter antennae than bees and wasps do. Some flies sip nectar from flowers and may mimic the colouring of bees or wasps. So take a close look! This Hover Fly is yellow and black, like a bee or wasp - but it has short antennae and only two wings, unlike a bee. 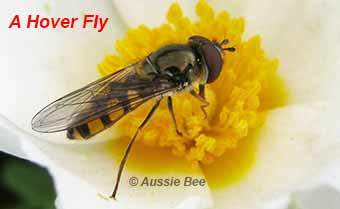 Hoverflies are common flower visitors and can be good flower pollinators. To help you distinguish bees, flies and other common pollinators, download the great ID guide from Wild Pollinator Count. Australian native bees need our help! Native bees are vital pollinators for our bushland and our crops. However, insecticide use can kill native bees, and landclearing can destroy their food resources and nest sites. What can we do? It is important to avoid or limit the use of insecticides where possible. Plant a Bee-Friendly Garden to provide food for your local native bees, and set up Bee Hotels to supply them with nest sites. Read more about How to Help Save our Australian Native Bees!